Bass Tub has been in the business of sport fishing for decades. Whether you are looking for a half-day trip with other parties trolling for many species, or you want to charter a full day trip to the remote reaches of the Pacific coast in search of that coveted species, they are the crew and boat you want for your trip. Trips start at $100 per person! 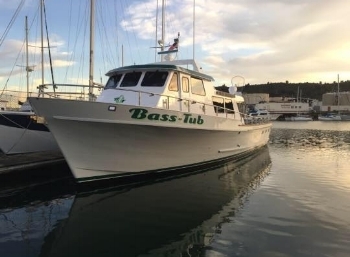 Bass Tub is also a top choice for private yacht charters. As a luxurious and high-end vessel with a state of the art sound system Bass Tub is a great choice for your next birthday event, a team building activity, or even a memorial at sea. Capt. Joey represents the 2nd generation of charter sport fishing in the Morini family and the operation has been taken over by his family since his passing. We still offer the same quality fishing experience and take pride in making your fishing day fun and enjoyable. The Capt. Joey specializes in additional charter activities such as sightseeing, whale watching, special occasions, corporate events and funerals at sea. We are your one stop resource for all your on-the-water adventures. We have two boats to serve you and all our boats come with a professional crew to allow you to enjoy your experience. Our fleet is owned and operated by Captain Joe. We are available for boat rentals, custom charters, sightseeing, eco tours or whatever you dream up! "Chucky’s Pride” is one of the most beautiful sport fishing vessel located at world’s renowned San Francisco Fisherman’s Wharf. She is a 50-foot Delta/Delta fiberglass vessel, inspected and certified by the Coast Guard for 49 passengers. Chucky’s Pride is powered by a pair of Cummins QSL-9 400 horsepower diesel engines with a cruising speed of 16 knots. She has been most recently refurbished throughout with the latest state of art electronics and safety equipment. All fishing trips include everything needed except your fishing license and your meals. Complimentary snacks and beverages are available. Hand built custom rods by Vic’s Custom Rods are set up by Capt. Steve prior to each trip for the type of fishing booked. Capt. Steve uses Avet fishing reels on the custom rods. There are also rods & reels available for lefties! And, of course your own equipment is always welcome. 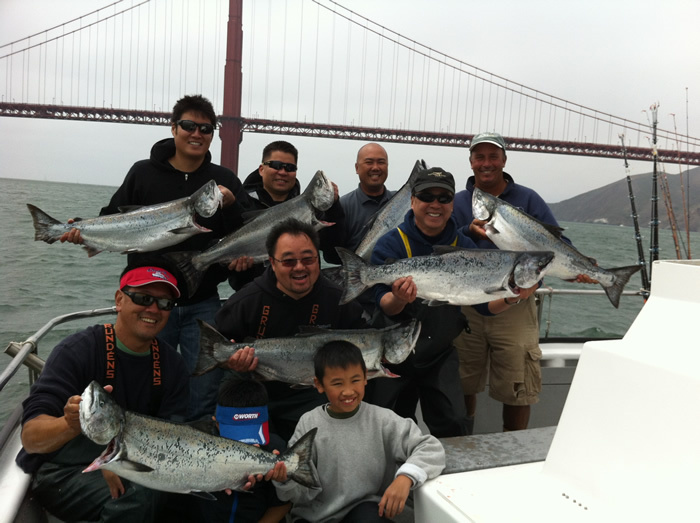 All bay area fishing trips include Capt. Steve’s personal service. He will assist with everything, even casting if needed. HyperFish offers a variety of water activities in the San Francisco Bay and beyond: Sport Fishing, Sunset Cruises or swimming the Escape from Alcatraz. Our boat HyperFish is a luxury charter boat that is certified to carry 24 passengers. She is fast and comfortable and will make every trip your best experience on the water. 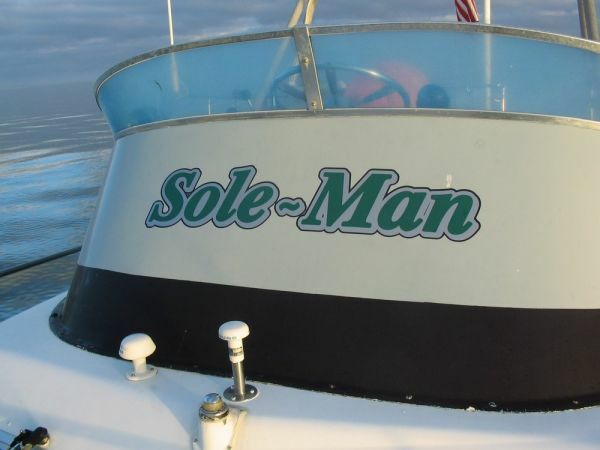 Captain Don "The SoleMan" Franklin operates the finest, best equipped charter boat on Fisherman's Wharf. You will be able to experience some of the finest Halibut, Rock fish, Sturgeon, and Shark fishing anywhere! Captain Don has many years of local experience, and knows the Bay and ocean like the back of his hand. Get ready to catch a trophy fish with Captain Don "The SoleMan" Franklin. The Wild Wave has the best of the best state of the art electronics for fish finding and navigating safely. With a maximum of only six anglers per trip you are guaranteed more room to relax and enjoy your fishing experience. Whether it is a open load or a private charter all bait, fishing tackle, rods and reels are provided. The only items required to bring are your California fishing license, lunch, sun screen and camera to snap a picture of your catch. Fish caught during your trip will be filled and bagged for you to take home and enjoy. The Wild Wave can be enjoyed for a fishing trip or bay cruises. Cruise the beautiful San Francisco waterfront with wine and cheese or depart on a afternoon fishing trip. We can make any dream trip to fit your needs. Captain Zizzo has been fishing San Francisco Bay and the Pacific Ocean for more than three decades. He and the gleaming blue and white Wild Wave maintain and enhance the lively historic Italian fishing traditions of San Francisco Fisherman's Wharf, making your sport fishing day a truly splendid adventure.